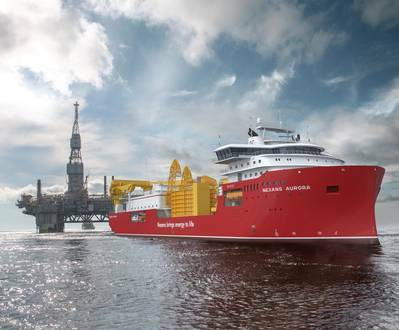 Bergen-based Vestdavit said has secured a contract to equip the Nexans flag ship cable layer Nexans Aurora with its MissionEase multi-boat handling system for mission bays. The cable laying vessel (CLV) has been designed by Skipsteknisk in Ålesund and will be constructed by Norwegian yard Ulstein Verft. At 149.9m in length, 31m width and with capacity to accommodate 90 personnel, she will perform power cable laying, cable system protection and trenching, and be capable of high maneuverability and DP3 station-keeping capabilities. Rather than using overhead cranes within the mission bay, MissionEase works on a system of hydraulic cradles which move vessels safely from their stowage positions to maintenance, preparation, or launch areas, Vestdavit said. This complete MissionEase system order, which davits installed either side of the mission bay, deck-mounted transfer rails and the unique cradle mechanism to handle multiple boats, follows on from a previous contract to supply a variant of the solution to Esvagt. The vessel has been designed specifically to operate in rough conditions. The davits to be used in combination with MissionEase are Vestdavit’s Telescopic TDB-5000 units, equipped with a range of safety features such as shock absorbers, constant tension, remote control and wire puller.